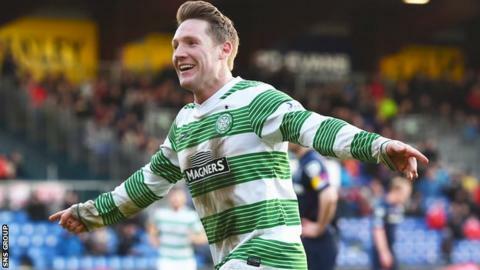 Kris Commons has signed a new two-year contract extension with Celtic, keeping him at the Scottish champions until the summer of 2017. The 31-year-old midfielder was due to be a free agent at the end of the season and negotiations over a new deal have been protracted. In December, Commons refused to agree to the one-year deal on offer. "I've loved my time at Celtic and this is where I want to continue playing my football," he said. "I want to continue playing my part in bringing more success to the club." Celtic manager Ronny Deila has been dealing with questions on Commons' future since October, when last season's PFA Scotland player of the year was first linked with a move to join former boss Neil Lennon at Bolton. "I am really pleased that Kris has committed his future to the club," Deila told the club website. "He is someone who has already made a great contribution to Celtic and I am sure he will continue to be a very important player for us as we work hard to bring our fans the success they deserve." Commons moved to Celtic Park from Derby in January 2011 and scored his 74th goal in last weekend's 2-0 League Cup semi-final victory over Rangers. He retired from international football in May 2013, having scored twice in 12 appearances for Scotland, saying: "I just want to give Celtic my 100% commitment and ensure I can prolong my club career as long as possible." He netted 32 goals last season but was used sparingly by Deila over the first half of this campaign. However, Commons has started all of Celtic's five games in 2015. "It's a huge burden off my shoulders and now I can concentrate on the proper stuff of playing football and winning trophies for this club," the midfielder told Celtic TV. "I'm absolutely buzzing. It's been a strange couple of months. Obviously speculation is never good for the mind and trying to play at the top level. "So now that's put to bed I can concentrate on football and trying to get this club trophies. It's a massive relief for not just myself but my family."